After several iterations of the Library Test Kitchen design studio (including a detour to SXSW), the publication of The Library Beyond the Book (whose final chapter assumes the form of a screenplay), and a spring 2014 Humanities Studio dedicated to analyzing, mapping, documenting, and interpreting the Harvard Depository, metaLAB is pleased to announce the Boston premiere of its documentary/web documentary COLD STORAGE on February 6 at 3:30 pm in Piper Auditorium at Harvard’s Graduate School of Design. The setting could hardly be more propitious: the inauguration of Icons of Knowledge at the Harvard Graduate School of Design’s Gund Hall, an architectural research exhibition curated by Daniel Rauchwerger and Noam Dvir, that looks at the history and evolution of national library buildings. Through original models, murals, and drawings, the exhibition traces national libraries to their origins in 15th century Europe and until today. Parce que leur mémoire est courte, les hommes accumulent d’inombrables pense-bêtes. Devant ces soutes pleines à craquer, les hommes prennent peur, peur d’être submergé par cette multitude d’écrits, par cet amas de mots. Alors pour garantir leur liberté, ils construisent des forteresses. So begins Alain Resnais’s 1957 collaboration with Chris Marker and Remo Forlani Toute la mémoire du monde, their evocative and sometime playfully self-reflexive tribute to the Biblothèque Nationale de France. The film begins in the underbelly of the BNF, only to rise up through the venerable building, circle its rooftop walkways, survey its stacks, and map its special collections rooms. The film concludes with an overview of the legendary Salle Richelieu, abuzz with readers, each of whom is deeply absorbed in contemplating his or her “slice of universal memory” (as Forlani’s screenplay would have it). Because their memory is short-lived, humans accumulate an infinity of memory aids. Confronted with the teeming depositories that result, panic sets in. They fear being trampled by information, submerged beneath heaps of words and data. So, to ensure their freedom, they erect formidable fortresses, faraway stockhouses, libraries that can’t be read except by machine minds. 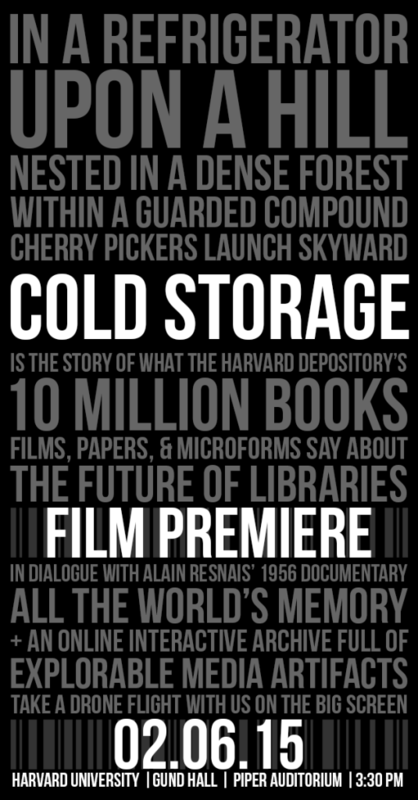 Whereas the Resnais film documents a world where books and readers, the dead and the living, comingle and coexist in the very same edifice, Cold Storage explores a world where the interplay of document and reader occurs along transformed lines. The HD serves as the dislocated heart of the Harvard University library system, housing close to ten million items in a facility that is at once a kind of analog server farm and a data center linked to a reading room as small as a handheld device or as big as the world. Cold Storage is but one component of a larger web documentary—a so-called database documentary—developed by metaLAB (at) Harvard in 2013-2014 as an “animated archive” and extension of the volume The Library Beyond the Book, published in 2014 in the metaLABprojects series by Harvard University Press.